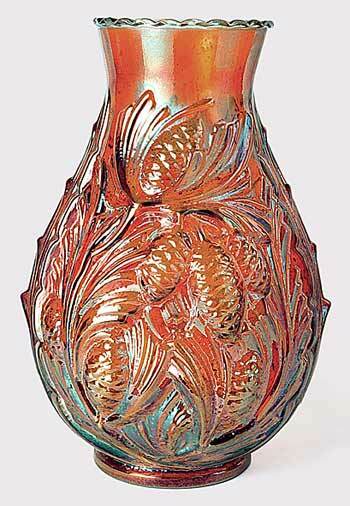 Until a couple of years ago, only three of these 12 1/2-inch marigold vases had been reported (one of them had a curious mark that indicated it was made by Coty of France). Then more began appearing. In 2005, one sold at auction for $1,000 (which had been found in Brazil); and two more brought $1,025, and $2,305 on eBay. In 2006, yet another sold on ebay for $1,000. Also in 2006, one sold at live auction for $925. So who made these interesting vases? As a result of research by Glen Thistlewood and Marcus Newhall, it's believed that the mold was originally made for the Coty perfume company, which was later purchased by the large French glass maker, Saint Gobain. It's thought that Saint Gobain at one point sent the mold to one of it's subsidiaries in Brazil where most of the vases now showing up were made.